Lendingclub's loan volume has surpassed 750000 US$. So far the average interest rate is 11.10%. 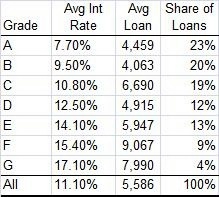 As you can see in the table the majority of loans went to borrowers with good credit grades. Lendingclub states that the top states where Florida, New York and Massachusetts. This differs from the state distribution of the Prosper loans, where California, Texas and Georgia are the states with most loans.